A friend of mine once complained that every time they talk about ebook reading devices, they’d immediately get at least one recommendation for the Kindle Paperwhite. I know for sure they are not alone. 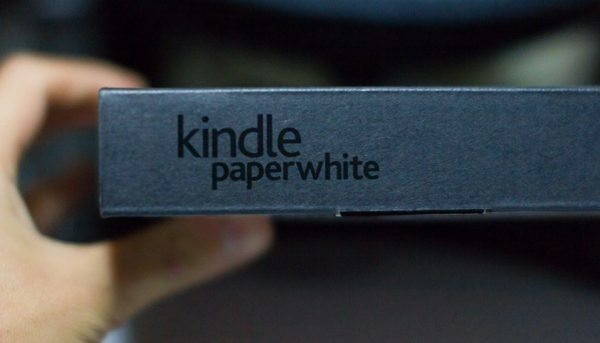 Of all the Kindles currently sold on Amazon, the Paperwhite gets the biggest number of reviews: more than 40,000. All over book lovers’ and bloggers’ and tech forums, everyone has been talking about the Kindle Paperwhite. It’s apparently not the cheapest nor the fanciest ereader ever made by Kindle. What’s with the crazy hype, you ever wondered? Here. Here you will find the answer. The Kindle Paperwhite has a simple (probably boring) design, especially when placed next to the beautiful Voyage, but it’s safe to say there are great advantages to that. It comes in a plastic shell, which feels very light on the hand. In fact, its total weight is only 7.2 oz (Wifi-only) or 7.6 oz (Wifi+3G). With a 6” screen, it is just right for putting into the pocket of your winter coat. 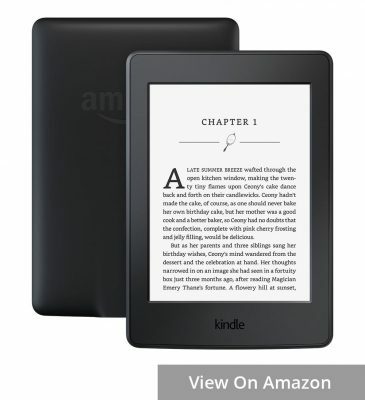 The Kindle Paperwhite is the Kindle with the simplest design, together with the Basic. It has no buttons or sensor points – just a screen. For many nostalgic fans, the buttons feel more “vintage” and look much better. But for most “contemporary” users, the removal of the buttons is practical as they’re used to doing everything on the screen. While it doesn’t make the device look fancy, the rough plastic back is resistant to slips, and doesn’t retain fingerprints after you hold it. You can always personalize the device with colorful, unique cases available in great quantity on Amazon. The Kindle Paperwhite comes in a typical Kindle screen, but it is a total upgrade from the Kindle Basic. First, unlike the Basic, which needs external light to read when the night comes, the Paperwhite is equipped with built-in light. It has 4 LEDs with fully adjustable brightness, allowing you to enjoy your books even in the dark. The Paperwhite is also has a much crisper display with eInk Carta technology. This Carta display increases the screen contrast, making it sharper and easier for the eyes to read. While the Basic retains a resolution of 167 ppi, the Paperwhite almost doubles it up. It jams in 300 ppi, exactly the same as the Kindle Oasis – the current king of all ereaders. In addition, the Carta display significantly reduces the friction when turning page, what happens all the time on e-ink devices. While it’s still there, it has been improved a lot compared to the Kindle Basic as well as other ereaders that use the earlier versions of eink display. Like in all other Kindles, the screen of the Paperwhite is glare-free. You can read under the sun in your garden or with strong lights on in your office. Gone is the need to read in weird, unhealthy postures to avoid screen glare! When it comes to storage, the Paperwhite has a space of 4GB, which translates into thousands of books. That’s certainly more than enough for you to read in a year. The ereader is available in two versions: one with Wifi connection only, and one with Wifi and (free) 3G for more convenience when you need to download books from places with no Wifi. Unless you have wireless on often, the battery is something you almost never have to worry about. Like other devices with e-ink, the Kindle Paperwhite can go for more than a month without you bothering to recharge it. This is why ereaders have such a status among book lovers – they can beat tablets on the battery hands down any day. The Kindle Paperwhite may not be waterproof or has warm screen light, but it is and will be for a long time, among, if not exactly, the most popular ebook reading device on the market. The reason? It inherits the amazing ecosystem of Amazon. First of all, it has the widest range of book selection on the market. There’s hardly any titles available in an ebook format that you can’t find on Amazon. 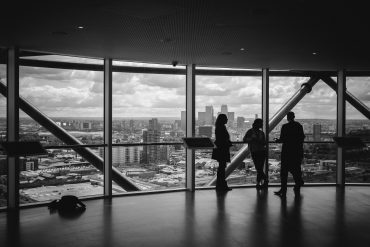 And it is so easy to browse, read the sample pages, and buy the books – all in a matter of minutes. The super affordable book prices also contribute massively to the success of the Kindle. Some are even offered for free, especially if you join Prime Reading or Kindle Unlimited. Also, you can loan, borrow books and share them with a partner and children in your household to read at the same time, cost free. Once you have started reading a book, the Kindle Paperwhite remembers where you’re at, and opens to the exact place even when you read on another device. If you see a difficult word, tap on it and the definition appears. The word will then be saved by the Vocabulary Builder for your further reviews with flashcards. You can also use its X-Ray feature to browse the contexts where the new words are used to reinforce your understanding and memory of the words. 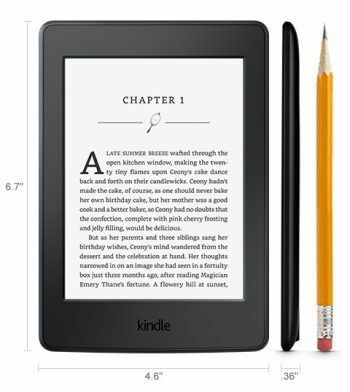 The Kindle Paperwhite certainly is not the cheapest ereader on the market, but at $120 for the basic Wi-fi only version, it is very easily affordable for most people. If you opt to remove the ads, which I don’t think is necessary – they’re about books and book-related deals anyway, that will be $20 more. Add free 3G connection and the device costs some other $70. Personally I’d rather not spend that money. I don’t find the 3G a necessity – I’m happy with downloading books with Wifi and read them while offline. Plus, the 3G version makes the device slightly heavier in weight too. Then again it’s just me, many of my friends who travel often find the 3G connection extremely useful. To sum it up, below is a brief overview of the goods and the bads in the Kindle Paperwhite. Design, functions, ecosystem, everything considered, it is not an exaggeration to say the Kindle Paperwhite is the best ereader in its price range. While there are more advanced models of Kindle, and other fancy ebook reading devices, the Paperwhite remains a device of standard quality and reasonable price that brings a pleasant reading experience to its user. That is the reason it is the best ebook reader to buy in 2017.